In some Jewish circles, tikkun olam is the essence of Judaism. Drawing from select passages in the prophetic tradition, it represents for them the ultimate Jewish value and the sum total of what being Jewish means. Take away tikkun olam and there is little left. In other circles, however, the approach to tikkun olam is the polar opposite. “Sure,” the argument goes, “there is a value in helping others out. But don’t we Jews have enough problems of our own to take care of first?” For them, tikkun olam is a messianic dream, but we dare not even think about it until we’ve taken care of Jewish poverty, the safety of Israel, rampant assimilation of Jews into their host cultures, massive under-observance of mitzvot, insufficient commitment to Torah-study, and so much more…. 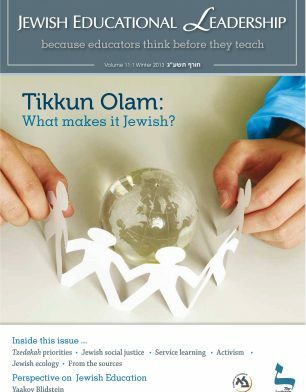 This issue of Jewish Educational Leadership seeks to address both of those polar positions as well as those who find themselves somewhere in the middle. We invite you to read more.